Engineers at a Texas university have developed a system to remote control cockroaches via a miniature computer, which is wired to the nervous system. It’s hoped they could be used for search and rescue missions as they can move about in tiny spaces. A team of researchers at Texas A&M University has created ‘backpacks’ weighing less than 3 grams for the insects. These hold the necessary equipment for humans to control the cockroaches, which include a tiny computer chip. This controls the nerves, which are used to help the cockroach walk, says the report published in the Journal of the Royal Society Interface. The insect could carry tiny video cameras and microphones that could be of great value in collecting information in hard-to-reach places – be that building debris or damaged infrastructure. The technology does not ‘tell’ the insect it must turn right or left. Cockroaches have six legs – three on each side. When the insect walks, the three legs on each side move in synch with one another. Therefore, by directing a pulse towards the middle leg, this meant it fell out of time with the others. So, if the team decides to send a pulse to the middle left leg, then the insect would turn left – a pulse to the right leg would mean the roach would go right. The research still has some way to go, with the cockroaches responding to the commands the team made about 70 percent of the time. One of the researchers believes they could have a valuable future, if the technology is perfected. 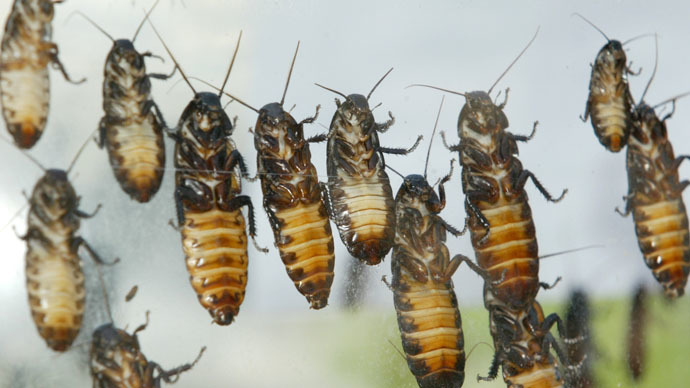 Even though cockroaches are capable of carrying five times their own body weight, the insects still get tired. According to Liang, this will hamper the amount of equipment they would be able to carry, which would be vital in search and rescue operations. “We put them on a treadmill for a minute and then let them rest. If the backpack is lighter, they can go on for longer,” Liang added.The research team from Texas A&M are not the first group to try and remote control cockroaches. In 2012, researchers at the North Carolina State University's Department of Electrical and Computer Engineering were able to wirelessly send electrical impulses to an electrical device on a cockroach’s back, which stimulated either left or right movement. "What we do is similar to riding a horse," assistant professor Alper Bozkurt said. "[The] cockroach walks naturally, and we simulate barriers by sending pulses to its antenna. They use their antenna as touch sensors, so stimulation on one side directs these insects towards the opposite direction,” he said, as reported by the journal Nature.